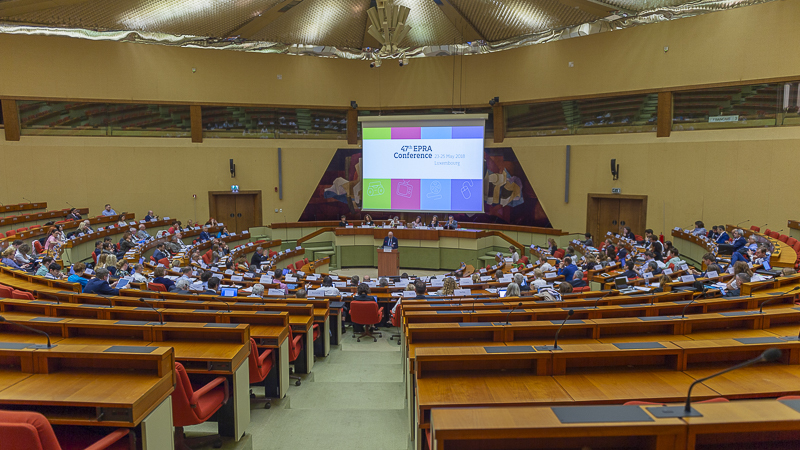 The 47th EPRA meeting took place on 23-25 May at the invitation of ALIA, the broadcasting regulatory authority of Luxembourg. The event gathered 157 delegates representing 49 member authorities. The plenary sessions focused on key challenges for democracy by addressing “The Future of Public Service & Public Interest Content in the Digital Age” (Plenary 1) and “The Regulation of Political Communication and the Challenges of Social Media” (Plenary 2). Plenary Session 1, on 24 May, shed light on the acute challenges that stakeholders currently face in the distribution and delivery of public service and public interest content. The session addressed the "legitimacy crisis" of PSM epitomised by the recent Swiss vote on the "no-Billag initiative" and looked at the relationship between PSM and commercial media and questions of distinctiveness, the challenge of reaching an ever more fragmented audience in its entirety; and the question of securing a solid funding basis for PSM. The session featured presentations from Florence Hartmann, EBU-Media Intelligence Service; Matthias Künzler, University of Chur; Tomas Myrbostad, TV2 Norway and Mika Rahkonen from Yle Finland. The presentation of Prof. Matthias Künzler is available at this link. Plenary Session 2, on 25 May, opened with a keynote by Prof. Dr. Damian Tambini of the London School of Economics on social media power and election legitimacy. In his speech, he emphasised that the emergence of dis-information and mis-information generally undermines media systems that have been designed to support the search for truth - and thus indirectly affects broadcasting regulation. In such a context, broadcasting NRAs have a responsibility and should not hide behind a limited mandate. Using policy advisory functions, publishing research and commenting on public debates are examples of tools that regulators could make use of. A panel composed of Stephanie Comey, BAI (Ireland); Elfa Ýr Gylfadóttir, IMC (Iceland) and Francesca Pellicanò, AGCOM (Italy) shared case studies based on recent interaction between media regulators and global social media companies in the context of elections and referenda. WG I: "Commercial communications 2.0: mapping changes" looked at the continuous development of new advertising techniques and the consequences for regulators and consumers. A panel composed of Bruno Martins, Union luxembourgeoise des consommateurs; Conor Murray, EGTA and Heiko Zysk, ProSiebenSat.1 provided valuable input for the debate. The participants agreed that the fast pace of the market evolution requires self- and co- regulation, as such agile tools respond to new challenges more adequately than legislation. Potential risks were also addressed: advertising money may shift in a way which could jeopardize media plurality and threaten the sustainability of small broadcasters and markets - and the European industry in general. Finally, regulators were advised to be consistent in their regulatory approach in order not to harm the European industry. They should also keep in mind the importance of consumers’ consent. WG II: on “Achieving greater diversity in broadcasting” identified and shared best practice and experience relating to improving gender diversity. EPRA members reported on gender representation and portrayal on-screen, across programming and advertising content. A panel discussion also debated on gender representation off-screen across the broadcasting industry. There seems to be a consensus that women are under-represented compared to men on-screen and off-screen, in programming and in advertising. Research is key: this is where each regulator must start the journey to tackling underrepresentation in order to understand the scope and scale of the issue. Several members reported that while they were conducting comprehensive research, they only have limited regulatory powers to make change happen. Nevertheless, regulators have clearly a role to play and should be considering what work they can do to ensure that women are represented generally and in senior positions in their own organisations. A final version of the background comparative paper will be produced in September. WG III: On the day of enforcement of the General Data Protection Regulation (GDPR), the group on "New challenges for Privacy" discussed current issues of concern for broadcasting regulators with regard to privacy matters in the linear and non-linear world. There seems to be a consensus among NRAs that the concept of privacy has shifted over time, notably as a consequence of the development of social media and new programme formats. Participants reported a great number of cases involving non-linear elements. Participants considered that the main challenges were the lack of specific remit for data protection, the absence of a well-established cooperation with data protection authorities and the lack of rules for the non-linear environment. This ad hoc group provided an opportunity to experiment a new form of interaction within EPRA, the interactive World Café format. The EPRA Taskforce for Media Literacy also met for the first time on the eve of the meeting in Luxembourg. Delegates from 22 EPRA members have already joined the Taskforce - all at different stages of developing their own approach to promoting media literacy in line with their own duties and obligations. The Taskforce's very first objective was to produce guidelines, as a kind of "check-list", on how to establish a national Media Literacy Network - as comparative research conducted within EPRA showed that working in collaboration with other stakeholders is a priority for many regulators. The meeting was also attended by permanent observer organisations (Council of Europe, European Audiovisual Observatory, European Commission, Office of the OSCE Representative on Freedom of the Media), as well as guest speakers from industry and academia (Mercury Insights, EBU-MIS, University of Chur (CH), TV2 (NO),Yle (FI), Wagner-Hatfield, ULC (LU), EGTA, ProSiebenSat.1, London School of Economics) and guest regulators from Morocco. On this occasion, elections to a vacant position of Vice Chairperson in the EPRA Executive Board took place. The Assembly of EPRA members unanimously elected Maria Donde, Head of International Content Policy at Ofcom, United Kingdom, as Vice-Chairperson of the EPRA Executive Board. A new member has also joined the EPRA network: The Office for Communications of Liechtenstein has become the 53th authority to join the platform whose mission is to provide an independent and transparent forum for audiovisual regulators to share relevant information, best practice, experience and expertise. EPRA was set up in 1995 in response to the need for increased co-operation between European audiovisual regulators. With more than 20 years of experience and a robust network of working-level contacts, EPRA is the oldest and largest network of broadcasting regulators and is an ideal setting for the exchange of information, cases and best practices between broadcasting regulators in Europe. It explores innovative means of regulating and analysing the audiovisual sector and sharing that with a wider audience of stakeholders. The next EPRA meeting will take place in Bratislava, on 10-12 October 2018 at the invitation of the Council for Broadcasting and Retransmission in Slovakia.